09.29.06 The World Chess Championship Match is in crisis and things are happening fast. 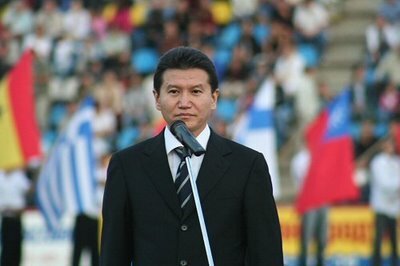 FIDE President Ilyumzhinov has cut short a meeting with Russian President Vladimir Putin and is on his way back to Elista. In the meantime, Kramnik's team has sent another open letter to Ilyumzhinov agreeing to play Game 5 if conditions--including a written letter of apology from Topalov's team and toilets connected to the rest areas--are satisfied. In addition, Grandmaster Yasser Seirawan, world-class player, organizer and chess broker, contributes his propsal to break the impasse. The protest made by the Topalov Team were not made within this window after game 4 (27 September 2006) but only hit the FIDE Office and the Appeals Committee on the rest day (28 September 2006). Therefore the protests are not even relevant and should have been rejected by the Appeals Committee immediately. Therefore it is clear that the Appeals Committee took a completely wrong decision and was obviously not even aware of the Rules and Regulations. The decision of Chief Arbiter Mr. Gijssen to forfeit game 5 was clearly based on a wrong decision of the Appeals Committee and shall be nullified. Mr. Kramnik is ready to continue the match and to play the 5th game (with a leading score of 3:1) on the conditions that were accepted prior to the start of the match. The toilets connected to the restrooms shall be opened again. This request is in accordance with clauses 3.17.1. and 3.18.3 (see above) and in the general understanding that by starting of the match both participants agreed to all the playing conditions. Any change of the playing conditions without a good reason would require the approval of both players which is not the case here. Mr. Kramnik is ready to accept even stricter controls by sealing the toilets before and after inspections. Inspections shall be done before and after each game. We repeat that the Kramnik team does not trust the objectivity of the Appeals Committee anymore. It is evident from this letter and our first Open Letter today that the existing Appeals Committee is biased and incompetent. Mr. Kramnik strongly insists once again that the members of the Appeals Committee will be exchanged immediately. As Mr. Kramnik in the press conference stated he did not sign a contract for acting in a reality show. The recordings shall be observed by the arbiters. Neither Team Topalov nor Team Kramnik shall have access to the recordings. Investigations shall be in the sole responsibility of the Arbiters. 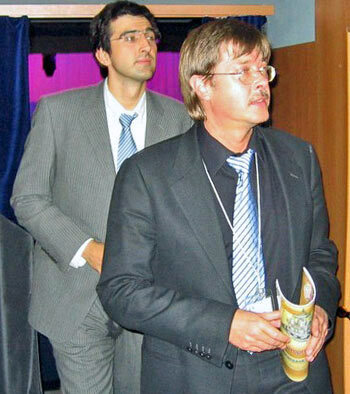 ’ÄúIf the match were to continue, the World Champion will refrain from shaking hands with Mr. Kramnik before the games and will not take part in joint press conferences with him.’Äù and ’ÄúVeselin Topalov is disturbed by the suspicious behavior of his opponent Mr. Vladimir Kramnik who takes his most significant decisions in the bathroom.’Äù are clearly insulting. Will Seirawan be the voice of reason? I am writing an open letter to you regarding today's events during the 2006 Unification World Championship Match between the Classical World Champion Vladimir Kramnik and the FIDE World Champion Veselin Topalov. For far too long the chess world has been in a terrible schism, and a successful conclusion to the current match is of paramount importance to chess fans and to the future of our sport. With tempers currently running high, it is time for all parties to show their manifest goodwill so that the match can resume, so that the players can demonstrate their skill over the board and so that chess fans can enjoy a resumption of the exciting games we have seen so far. I would therefore urge that all parties calm down and reflect upon the events that have led to today's aborted game. It is my understanding that Veselin Topalov lodged an official complaint that his opponent visited his bathroom an excessive number of times during play, casting a suspicion of unfair behavior. The Appeals Committee agreed that the complaint had some basis and decided that the solution was that the players would henceforth share a common bathroom. In so doing the Appeals Committee made a clearly erroneous decision, which it should now reverse with good grace. Before the start of the match, a contract was signed by all parties. Furthermore, before the start of play all parties inspected the playing area, the separate restrooms and the separate bathrooms. These were the conditions agreed to by all the parties, and the match began. Thereafter, any changes to these arrangements would require the unanimous agreement of all parties. It was therefore wrong of the Appeals Committee unilaterally to withdraw from Vladimir Kramnik the conditions of play to which he had agreed, namely use of a separate restroom and bathroom. Angered by the decision of the Appeals Committee, which violates the match contract, Vladimir Kramnik has stated that he considers the Appeals Committee biased against him and asks that the members of the Appeals Committee be changed. Firstly, since separate bathrooms were agreed to by all parties, they should be reinstated with immediate effect. Secondly, to assuage any suspicions of unfair behavior, the bathrooms should have an attendant at hand during play. Thirdly, Game Five should be rescheduled and played tomorrow, Saturday, September 30, 2006 at the usual time. Finally, the Appeals Committee members should be allowed to remain in place as the Committee is currently constituted. However, the Committee made an error and its decision should be reversed. Veselin Topalov followed the proper channels of protocol to lodge a complaint, and his complaint was upheld. It was the Appeals Committee which over-reacted, exceeded its authority and failed to respect the contract signed by FIDE. It is my sincerest hope that this solution will be regarded as measured and fair to all parties and that the unfortunate disagreement can now be resolved promptly. Then all of us in the chess world can resume our enjoyment of a fascinating over-the-board contest between two magnificent players. Great intrigue! We as observers are not privy to the match contracts signed by the players, so all such individual opinions are circumspect in relevance. 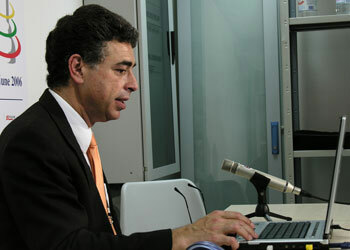 Mr. Seirawan is informed of the specific match contract conditions, so his proposal deserves respect. This is rich!! Topalov is suspicious because Kramnik is using his toilet too many times!! Topalov thinks Kramnik is possibly accessing a cheat sheet of some sort and he (Topalov) lodges a complaint after losing the match. Dan, my advice to you -- put away the chess boards, buy a TV and start watching professional football.